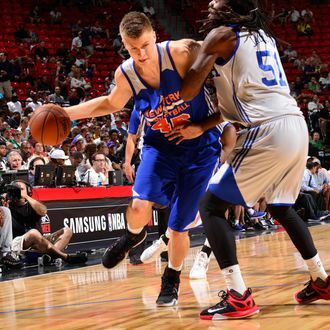 Kristaps Porzingis, during the NBA's Summer League. The Knicks had the fourth pick in this year’s NBA Draft, and the night should have been an opportunity to celebrate the addition of a possible cornerstone of the franchise’s revitalization. The night’s most indelible image, however, wasn’t one of jubilation but, rather, that of a small child in a Knicks jersey crying over the team’s selection of Kristaps Porzingis, a seven-foot-two forward from Latvia. The Knicks’ draft history in recent years has been spotty, and they’ve had a dismal record with foreign-born players. Sure, Porzingis has a lot of potential — so did Frédéric Weis, and these days he’s running a tobacco store in France — but he’s also a long way from becoming a major contributor. So you could forgive fans for not giving the team the benefit of the doubt, especially when there were plenty of highly talented players available who could make an impact right away. Knicks president Phil Jackson’s teams have long used the complicated Triangle offense, and in Vegas Porzingis also showcased a deft passing touch that could fit nicely into that system in New York. He appeared comfortable within the game’s flow (important in the Triangle offense, which stresses a mix of isolation and ball movement), and showed the necessary court awareness to create open space and mismatches in the half-court. He also won over fans by blocking three Okafor shots in the second half of the game against the Philadelphia 76ers. So does this preview of Porzingis’s game mean we can expect him to play at an All-Star level during his rookie year? Not exactly. The hype over his offensive skill-set is deserved, but he still needs to make significant progress in other areas before he’s a starter, much less a star. While coach Derek Fisher will use Porzingis’s speed and agile footwork to create lineup problems, he’s still a defensive liability: The blocked shots of Okafor made for good highlights, but the former Duke center had consistently schooled Porzingis during the first half of that game, using an extensive array of post moves and lower-body strength to uproot the Knicks’ big man from his defensive position. Porzingis has already been tagged as a young Dirk Nowitzki, which may prove apt: It took time for the German-born big man to jell his raw skill with his developing body, and now he’s one of the game’s most iconic players. Porzingis’s ceiling might not be quite so high, but he’s looking like the kind of player who just might restore restore that crying kid’s faith in the Knicks.